Lian Hearn is the penname of Gillian Rubinstein, an award-winning Australian children’s author. Learn more about her at her website. CLICK HERE FOR MORE NOVELS BY LIAN HEARN. Tales of the Otori — (2002-2007) Heaven’s Net is Wide is a prequel. Publisher: A new epic trilogy that has already become a bestselling sensation in England and Australia, earning comparisons to The Lord of the Rings. It begins with the legend of a nightingale floor in a black-walled fortress — a floor that sings in alarm at the step of an assassin. 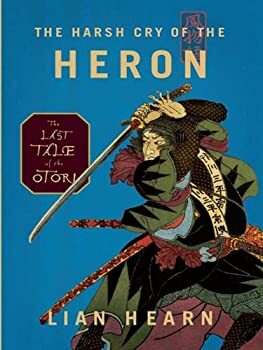 It will take true courage and all the skills of an ancient Tribe for one orphaned youth named Takeo to discover the magical destiny that awaits him… across the nightingale floor. 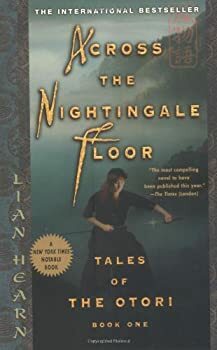 The tagline stamped across the cover of Lian Hearn’s Across the Nightingale Floor is ‘One boy. One journey. One hidden destiny.’ Not only is this toe-curlingly clichéd, but it’s also pretty deceptive. It’s too reductive, too suggestive of the bog standard hero’s journey every fantasy fan has seen a million times. The book’s plot is complicated and surprising; its backdrop of a political feudal system riveting; the delicate Japanese-style landscape and customs are intricate. Across the Nightingale Floor, the first book in Lian Hearn’s TALES OF THE OTORI, is so much more than one boy, one journey, one hidden destiny. It’s fantasy at its finest and characters at their richest. 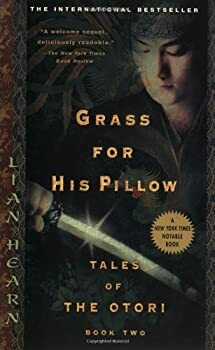 We saw myth, legend, folklore and tradition of feudal Japan seamlessly woven in Across the Nightingale Floor, and Grass for His Pillow offers equal richness and storytelling depth. In what marks the second book in the trilogy, Lian Hearn returns to the stories of Takeo and Kaede as they choose their alliances amidst increasing unrest between the clans. With a complicated web of back-story set up and a return to familiar characters that we’ve seen develop, it goes without saying that Brilliance of the Moon should be the gripping climax of a trilogy that has thus far moved from strength to strength. 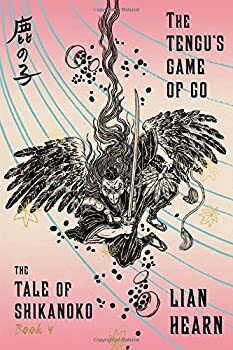 The third and final instalment of the TALES OF THE OTORI series, the book has many loose ends to tie up, not to mention a certain prophecy that needs fulfilling. Across the Nightingale Floor and Grass for his Pillow were always going to prove tough acts to follow, and unfortunately Brilliance of the Moon doesn’t quite live up to its predecessors’ standards. Beauty, Grace, Eloquence. These words define the writing of author Lian Hearn. Her Tales of the Otori series of historical fantasy novels are extremely popular worldwide. If you haven't read the first four installments, Heaven's Net is Wide is a great place to begin the story. Because it is a prequel, Hearn has not assumed the reader has much knowledge about the setting or characters. She begins with a hook, describing a confrontation between two members of the Tribe — a family of assassins. Readers of the prior books will recognize the importance of this event right away, but for the new reader, Hearn begins on just the right foot, hooking them into the story. 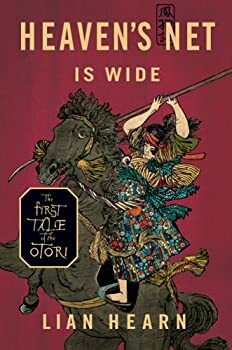 Whilst it never gained the traction of the likes of Pullman and Potter, the TALES OF THE OTORI series has all the same ingredients: the epic scope, mystery and intrigue, impossible love and an entirely immersive setting. Whether it was luck or timing that never saw the series reach the same heights as its contemporaries, its same crossover appeal proves it is surely one of the great YA fantasy series. So how is it possible that Lian Hearn (pseudonym of Gillian Rubinstein) can undermine this entire sweeping epic in one fell swoop? The Tale of Shikanoko — Published April – September, 2016. In the opening pages of the action-packed Book One of Lian Hearn’s epic Tale of Shikanoko series–all of which will be published in 2016–a future lord is dispossessed of his birthright by a scheming uncle, a mountain sorcerer imbues a mask with the spirit of a great stag for a lost young man, a stubborn father forces his son to give up his wife to his older brother, and a powerful priest meddles in the succession to the Lotus Throne, the child who is the rightful heir to the emperor barely escaping the capital in the arms of his sister. And that is just the beginning. As destiny weaves its rich tapestry, a compelling drama plays out against a background of wild forests, elegant castles, hidden temples, and savage battlefields. 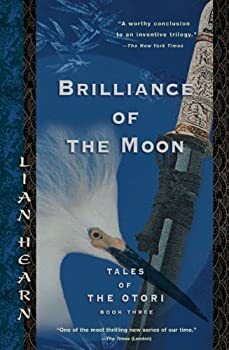 This is the medieval Japan of Lian Hearn’s imagination, where animal spirits clash with warriors and children navigate a landscape as serene as it is deadly. Emperor of the Eight Islands, by Lian Hearn, is the first book in a series of four, called THE TALE OF SHIKANOKO. The books are published by Farrar, Straus and Giroux, and all four will be issued in 2016 (April, June, August, September). The publisher has used this compressed release schedule before, most notably with Jeff VanderMeer’s AREA X trilogy. Lian Hearn’s Autumn Princess, Dragon Child, the second book in THE TALE OF SHIKANOKO, begins right where the first book ended. This series plays out on a broad canvas and in this volume we follow some characters we saw only briefly in Emperor of the Eight Islands. Some characters find that their story arc ends in this book, as the story grows darker and more tragic, but the book never loses momentum. This review may contain mild spoilers for Book One, Emperor of the Eight Islands. This is Book Three in a quartet and this review may contain spoilers for earlier books. In the third installment of Lian Hearn’s THE TALES OF SHIKANOKO, the story moves to the next generation, with the true emperor and the son of Shika and the Autumn Princess. In Lord of the Darkwood (2016), characters who previously played supporting roles take center stage, and for the first time in the series we meet a tengu, the magical birdlike beings that are not necessarily evil but definitely dangerous. At the beginning of THE TALE OF SHIKANOKO, Shikanoko’s father played a game with a tengu. He lost, and what he lost cast an entire kingdom into disaster. Shikanoko, whose birth name was Kazumaru, was tainted by sorcery and as much a victim as a wielder of it. Now, in The Tengu’s Game of Go, the second generation rises to try to set things right.